Led by Musicians First Class Davy DeArmond and Chris Buchanan on trumpet, The Naval Academy Band’s “Gold” Brass Quintet traveled to Columbus State University in Georgia on May 23 to perform at the International Trumpet Guild’s annual conference. Rounding out the quintet were Musicians First Class Nathaniel Willson on horn, Clint Woltering on trombone, and Travis Siehndel on tuba. 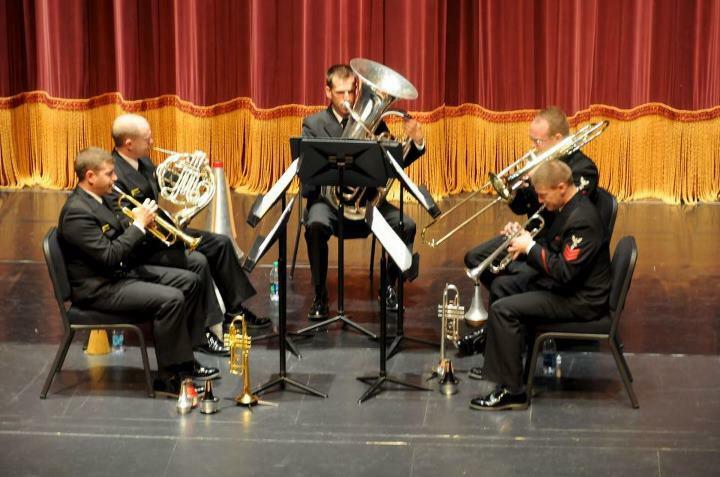 With Commissioning Week festivities in full effect, it was a very quick trip, but well worth the effort and the quintet was thrilled to perform at this significant event. Some unexpected excitement hit when we landed in Atlanta and one bag had been mishandled by the airline. Typically, this wouldn’t be a big deal for an overnight trip. But when that bag holds a uniform that will be worn by one of our trumpet players during our performance, it becomes a bigger deal. We decided to carry on in hopes that the uniform would be delivered later that day by the airline. After making an important stop for lunch that included such local delicacies as sweet tea, barbeque and Brunswick stew, the quintet arrived in Columbus for a sound check in the beautiful River Center for the Performing Arts. The building features a beautiful hall and we were feeling good for our performance the following day. The only thing left to do was check in to our lodging and wait for the airline to deliver our lost bag. If only life was that simple. After many calls to the airline, the bag finally arrived at the airport at 11:30 pm. Chris and Davy hopped in the van, made a trip back to Atlanta for the bag, and by 2:30 am we had five musicians and five uniforms. Our performance began the next morning at 9:30. In a lucky twist, the opening act for our performance was the Ohio State University’s Trumpet Ensemble. This group included Matt Harriman, who will leave for boot camp very soon to join the Band as our newest hire on trumpet. Matt and his group sounded fantastic and it was a great opener for our performance. We look forward to him joining us in Annapolis! Our program featured Entrance by David Sampson, Circus by Clint Needham, Michael Kamen’s Quintet, The Florentiner March by Julis Fucík, Street Song by Michael Tilson Thomas and Escape by close friend of the quintet, Kevin McKee. Be sure to check out the Kennedy Center’s website for an archived recording of the same program performed in April.